The Battles for Cassino encompassed one of the few truly international conflicts of the Second World War. A strategic town on the road to Rome, the fighting lasted four months and cost the lives of more than 14,000 men from eight nations. Between January and May 1944, forces from Britain, Canada, France, India, New Zealand, Poland and the United States, fought a resolute German army in a series of battles in which the advantage swung back and forth, from one side to the other. From fire-fights in the mountains to tank attacks in the valley; from river crossings to street fighting, the four battles of Cassino encompass a series of individual operations unique in the history of the Second World War. Authors Jeff Plowman and Perry Rowe have spent several years studying the conflict together and walking the battlefield to take the hundreds of comparison photographs which are the raison d’etre of all After the Battle publications. Photographs have been selected from archives and private collections around the world to present a balanced view, combined with maps, orders of battle, citations and detailed captions. 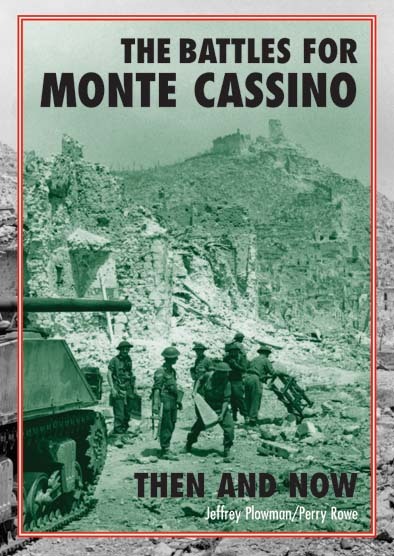 The Cassino battles, epitomised by the controversial bombing of the monastery which towers menacingly over the battlefield, stand at the centre of the Italian campaign. The dogged defence by a 100,000 men of the German XIV. Panzerkorps under General Frido von Senger und Etterlin, facing a greater multi-national force, was only routed in the end by a gallant French flanking manoeuvre, with the Poles marking the final victory by hoisting their national flag over the ruins of the Monastery. For New Zealand residents the book can be obtained from Dal McGuirk in Auckland for the special price NZ$110 postage paid. Contact Dal directly by email at: dalmcguirk@hotmail.com or see here for Dal's brochure containing order details.